Welcome spring and join the Springfield Museums for the annual Festival of Flowers, Thursday, April 5–Sunday, April 8, 2018. 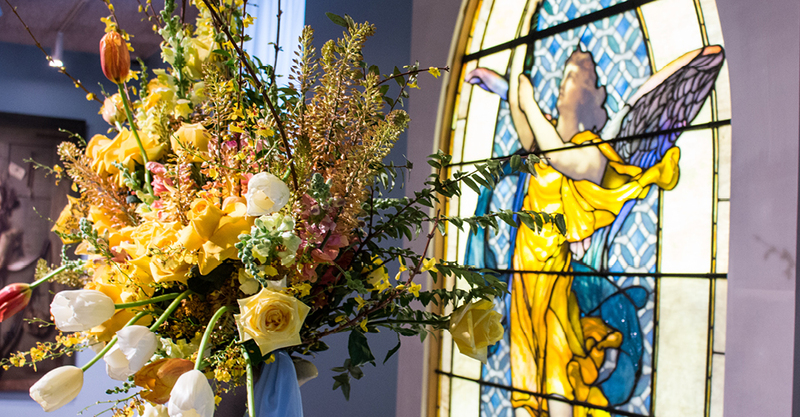 This beautiful and creative annual celebration attracts more than 4,000 people to the Museums where visitors can bask in the beauty of floral arrangements created by local florists, designers, and garden club members. The Festival of Flowers, which is an outgrowth of Art in Bloom, is in its 6th year. And Barbara’s arrangement is one of many that is sure to attract attention and spark conversation and awe. The Festival of Flowers has become one of the most anticipated moments in the Museums’ calendar. Free with museum admission. Celebrate Festival of Flowers with signature cocktails and creative hors d’oeuvres. View the interpretive arrangements in four museums while enjoying music, floral demonstrations, hands-on activities, and a garden of living sculptures. Catered by Log Rolling. $10 members; $20 nonmembers. Culture & Cocktails is sponsored by American International College and United Personnel. Reservations suggested: Call 413.314.6479 or visit SpringfieldMuseums.org/flowers. Join experienced docents as they discuss the interpretive floral arrangements and the museum objects that served as inspiration. Free with museum admission. Claude Monet was an avid horticulturist and arguably the most important painter of gardens in the history of art, but he was not alone. Great artists like Van Gogh, Bonnard, Sorolla, Sargent, Pissarro and Matisse all saw the garden as a powerful subject for their art. These great artists, along with many other famous names, feature in an innovative and extensive exhibition from The Royal Academy of Arts, London. From the exhibition walls to the wonder and beauty of artists’ gardens like Giverny and Seebüll, the film takes a magical and widely travelled journey to discover how different contemporaries of Monet built and cultivated modern gardens to explore expressive motifs, abstract color, decorative design and utopian ideas. Guided by passionate curators, artists and garden enthusiasts, this remarkable collection of Impressionists, Post-Impressionists, and avant-garde artists of the early twentieth century will reveal the rise of the modern garden in popular culture and the public’s enduring fascination with gardens today. Long considered spaces for expressing color, light and atmosphere, the garden has occupied the creative minds of some of the world’s greatest artists. As Monet said, ‘Apart from painting and gardening, I’m no good at anything’. For lovers of art or lovers of gardens, this is an ideal film. Free with museum admission. Dine in elegance. Enjoy tea, light sandwiches, and desserts surrounded by floral arrangements in Blake Court of the D’Amour Museum of Fine Arts. .
Children will explore the world of flowers through hands-on activities. Arrange your own bouquet, make wildflower seed paper to plant at home, taste honey, and learn about the role of pollinators, and touch flowers from around the world. Children will receive a free copy of Daisy-Head Mayzie while supplies last. Free with museum admission. Supported by Durocher Florist, Springfield Florists Supply, Inc., Gardeners on the Green in Longmeadow, MA, Pennock Floral, and Randall’s Farm & Greenhouse. The Mass Cultural Council is a supporter of the Festival of Flowers. MassMutual Foundation is the season supporter of the Springfield Museums.